My cartridge is marked as being intended for single use. Is there any problem refilling these Lexmark P915 cartridges? Do you include instructions? Reliable and cost effective, printing with the Lexmark P915 gives high quality results fast. Some day in the future your Lexmark P915 will use all of your printer ink, and then you'll quickly note that brand new Lexmark P915 ink may be quite costly. Fortunately you don't have to be anxious about shelling out the steep prices you'll discover on the high street because here at Cartridge Save you can buy all the Lexmark P 915 cartridges you will ever want at low cost. Save a lot of cash on your ink by buying online with the UK's foremost inkjet cartridge provider, Cartridge Save! Don't pay high prices for a P-915 original cartridge or P915 compatible ink in the main street when it is much more straight forward to save money ordering with Cartridge Save. You enjoy one hundred per cent satisfaction when you buy Photo Inkjet P915 ink cartridges from us because each one is guaranteed by a no quibble money back guarantee. Bear in mind the fact that each purchase also comes with free delivery, typically arriving at your doorstep on the following day! The P915 photo printer is aimed at users looking for a general-use device for basic photo printing and document printing needs. Although it boasts a good software, speedy text printing, and a low initial price, the overall print quality of the Lexmark P915 is disappointing for discerning photo enthusiasts. With a compact frame that measures 5.9 inches tall, 9.3 inches deep, and 16.9 inches wide, the Lexmark P915 fits most desktops and cramped home offices that need a colour photo printer. It comes with a colour preview screen and prints in maximum resolutions of 2400x1200dpi (black-and-white) and 4800x1200dp (colour). Apart from the simplistic control panel, the front section of the printer is home to media card slots and a PictBridge port. The total media capacity is up to 100 pages only, and paper can be loaded at the versatile rear input tray. The Lexmark P915 will look the part on your desktop with its flashy cream and blue exterior. 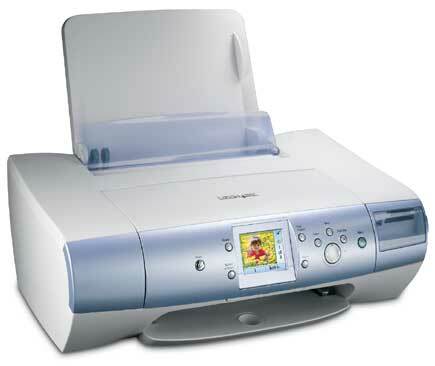 The P915 is an affordable colour printer with satisfactory features for photo printing needs. It boasts a clear 2.5-inch LCD screen for previewing photos from a memory card, and the additional PictBridge port helps users save time by printing directly from their digital camera. The Lexmark P915 inkjet printer is quick to print text documents, while the software that comes with it is bundled with useful features to help users maximise the functions. Print quality is one of the setbacks of the Lexmark P915; it cannot be considered at par with better colour photo printers by Epson and Canon. Lexmark may need to improve on the quality of its inks and make sure it dries fast to prevent smudging, especially on special media. The cheap plastic components of the Lexmark P915 makes the overall construction rather flimsy and although the overall look may be pleasing on the eye this printer may be a case of style over substance.